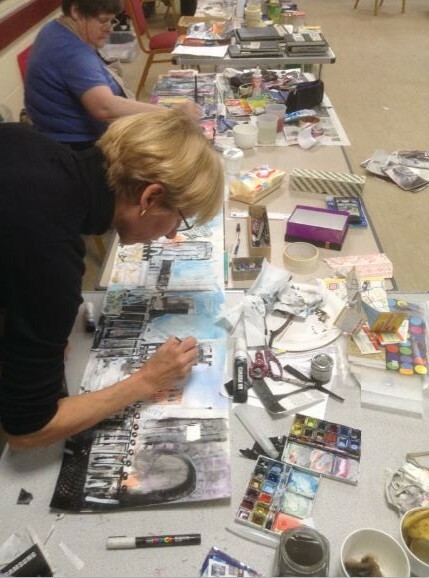 This is a fun two day workshop, you do not need to prepare anything, just come along and develop your sketchbook pages in a supportive and beautiful environment. There is very little observation drawing in this workshop, it is much more about mark making and responding to the materials and techniques used. Karen will lead you through different wet and dry techniques to build up layers in your sketchbook. On the first day you will work with inks, pens, pencils and collage to develop 6-12 pages with mark making, collage and layering techniques. Day two, you will work into these pages with some drawing and more collage. This can be from your own sketches/images or the local surroundings (weather permitting). You will learn how to respond to the graphic elements and the scenery, as in Karen’s sketchbooks. You can move in and out of the studio as you need to, no walking across fields involved! When heading out with my sketchbook, I am drawn to old towns (and boat yards!) My sketchbooks are a memory bank, not just the scene in front of me but all around; the shapes, textures, smells and sounds, they are all of equal importance. Growing up on the east coast of Yorkshire as a happy beachcomber, I was attracted to the faded painted wood, scraps of gaudy plastic, brightly coloured fishing floats and nets: all sun dried, sand blasted, salted and weathered. My Dad’s passion was sailing, each Friday we would pack up and spend the weekend on the coast. I was free to wander, explore and collect only returning at mealtimes. This freedom set my path. After art college I worked and wandered the world for ten years, all the time constantly sketching and collecting a rich resource of tickets, labels, packaging, stamps, paper bags and scraps of lettering; each one telling its own story; scraps of city life ready to become the first layers of a collage or sketchbook page. Working in collage, combining found papers with drawing I can create a patchwork of places, people and journeys, all bonded together; some fading, some peeling, some permanent. The slick, neat and new makes little impression on me; it is pin holes, crease lines and torn edges of paper that fires my imagination. A few years ago I started working in A5 concertina sketchbooks. I fell in love with the story of mark making that could develop and move across the pages. This format lends itself so well to any cityscape, landscape or seascape. I continued to use collage and reduced the amount of paints and pens that I took out with me. Working with limited materials I developed techniques that are very free and responsive: the images evolve from the materials in the book as well as observation.